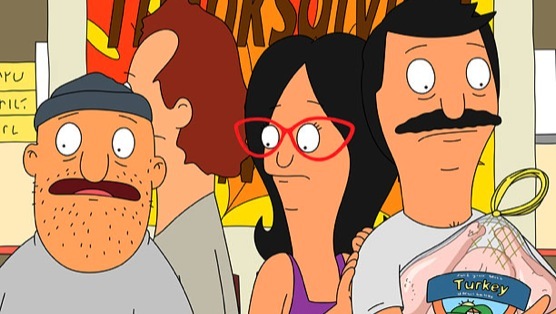 Just as The Simpsons have cornered the market on Halloween-themed episodes with their annual “Treehouse of Horror,” so too has Bob’s Burgers become the most reliable source for Thanksgiving-themed hilarity. And this year, writers Wendy and Lizzie Molyneux have upped the ante by adding a Hitchcock-style bird attack, and one of the best uses of Donna Summer’s music to soundtrack a scene. What starts this all off is the Fischoeder brothers’ attempt to add a new holiday tradition to the wharf: The Turk-tacular Turkey Town Festival and Turkey Trot. Or ½ off rides at the amusement park and a fun run where the participants are joined by 500 turkeys. Of course, things don’t go exactly as planned. Felix, unable to get just turkeys, mixes ducks, geese, and chicken in with the gobblers and with no pecking order in place, they start to attack the humans. This leaves Linda and Teddy hiding out in the amusement park while the kids get stuck on the Scramble Pan ride after the operator runs for his life. Where’s Bob while all this was going down? At home, getting drunk and lamenting the fact that he wasn’t cooking Thanksgiving dinner for his family. And dancing around to Donna Summer (“Hey daytime whiskey, do you want to meet my CD collection? I have a feeling you would hit it off…”). With the plot in place and the understanding that everyone will be alright in the end, that’s when the Molyneuxs and the voice cast can really start to have some fun. When Teddy, Linda, and Mickey strap stuffed animals to their bodies to make a run for the scrambler, the whole scene is soundtracked to Summer’s “Dim All The Lights.” And leaving Bob by himself is always the recipe for hilarity. He spends most of his time reconciling himself to his fate (“I guess I can sit in my not regular spot on the couch. I can even cross my legs and no one will make fun of me.”) and having conversations with inanimate objects like his hilarious drunken breakdown in the kitchen when he stumbles upon the turkey baster (“Don’t look at me like that, turkey baster! You think I wanted this? This isn’t what I wanted! I never wanted to be apart from you!”). There’s no real tension in the episode, just a bit of curiosity as to how the Belcher clan will make it out of this mess in one piece. That it takes Linda proving herself to be the “Queen of the Turkey” by pecking (or headbutting, rather) her family, is the perfect ridiculous touch that this show throws around with enviable ease. I can’t wait to see what happens for Christmas.